There was a beautiful sunrise a few weekends ago as I was on my way to hike and search for some new rock art and ruins in Southern Utah. 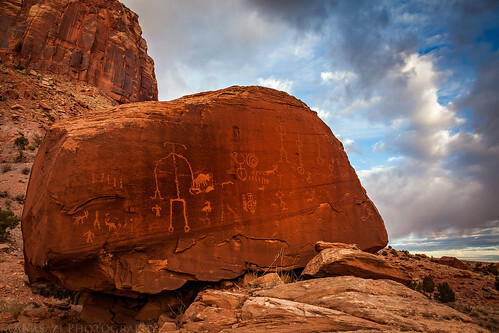 I just happened to be near this large boulder with Ute petroglyphs at the time and thought it might make a nice image. As the early morning sunlight bounced off the clouds above everything was bathed in a red glow for a few minutes. The storm clouds in the background were nice, too.